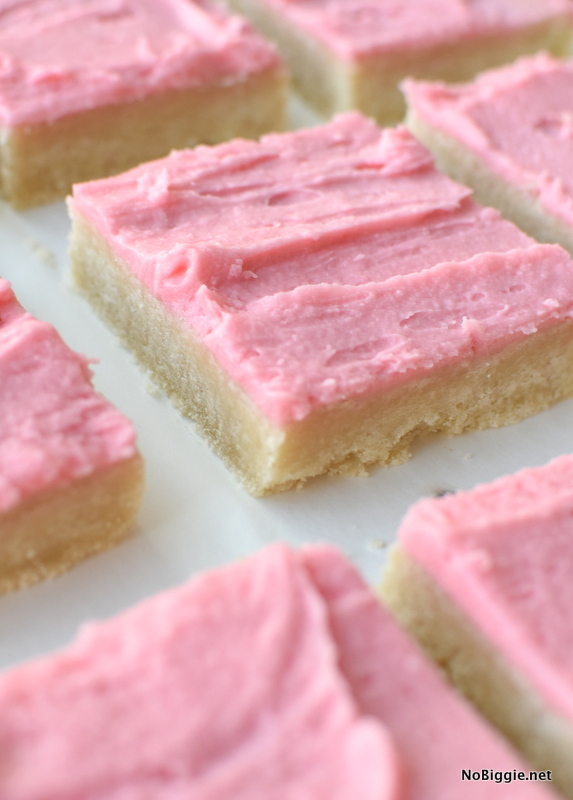 We’re whippin’ up a small batch of our favorite sugar cookie bars – Swig Style! 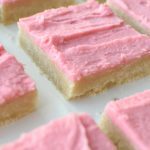 We’ve shared our favorite Swig Sugar Cookies here a few years back, and this time we cut the recipe in half and we’re serving them up as bars rather than pressed cookies, and it could not be easier! We even made a quick video so you can see them in action! 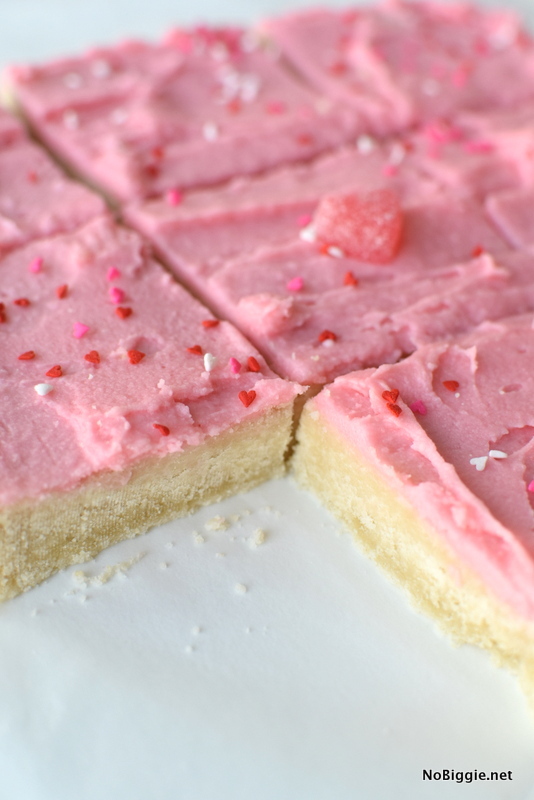 These soft sugar cookie bars are perfect for Valentine’s Day. 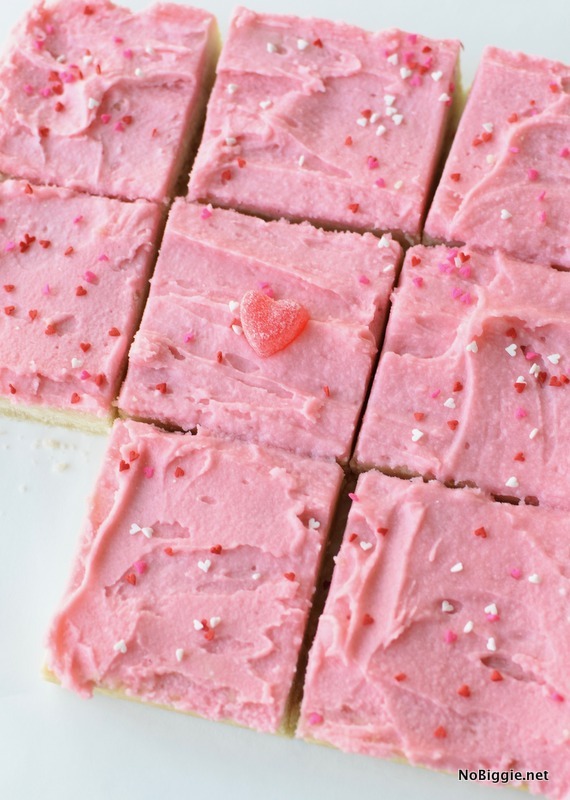 Speaking of Valentine’s Day, what do you crave more when it comes to sweet treats: chocolate, candy or sugar cookies? Or ALL OF IT!! 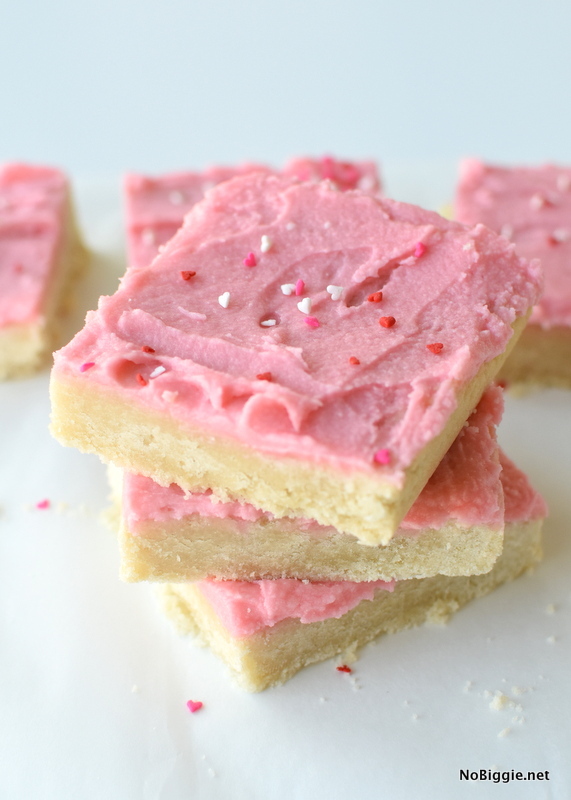 I guess I’d say I love it all, but there’s something about sugar cookies at Valentine’s Day that I just love, and these Sugar Cookie Bars are THE BEST! These cookie bars work year round with a simple change of the color of the food coloring and the sprinkles you use. Before baking, the cookie dough might seem dry and crumbly. Make sure to firmly press the dough into the baking pan. After baking let the cookies completely cool in the pan, and then refrigerate. The baked frosted cookie bars hold their shape well when cut if they’re chilled in the fridge. 3/8 cup veg oil 6 tablespoons or 3 oz. In a mixing bowl with a metal whisk, mix together flour, salt, baking soda, and cream of tarter. Set aside. In the bowl with a mixer, cream together the butter and sugars for 2 minutes. Slowly stream in the oil while beating. Add the water and vanilla and then beat the egg until combined. Now add the dry ingredients to the wet ingredients a little at a time, mixing until combined (scrape down the sides of the bowl as needed). Move the cookie dough into a parchment lined 8x8 or 9x9 baking pan. Press the cookie mixture down into the pan. Bake for 15-18 minutes, depending on your oven. Out of the oven, let the bars cool completely in the pan. FOR THE ICING: cream the butter, sour cream, and salt together. Add powdered sugar a little at a time, alternating with adding the milk. Add extra milk or powdered sugar if needed to reach your desired consistency. Add food coloring and vanilla and mix until combined. Using a rubber spatular add big dollops of icing onto the cookie bars and spread it evenly. Move the pan into the fridge to chill. Let the icing set to the touch before cutting them. These cookies are best served chilled, also because there is dairy in the icing, it's best to store them covered with plastic wrap in the refrigerator. When ready, cut into bars and add sprinkles if you’d like. I’m not a gooey cookie person are this done all the way thru when done baking? Thanks. They are under baked to keep them soft.